There is a good reason why this peony variety is named Dinner Plate. After blooming it’ll turn as big as one! If you are a fan of the colour lilac and want to make an impression on visitors, look no further than Paeonia Dinner Plate. 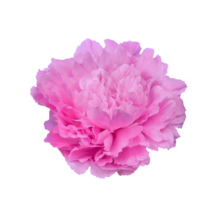 Paeonia Dinner Plate is one of the largest varieties on the market. The outer petals of its full-petalled flowers are lilac and have a fresh, satiny glow. During opening it will turn a lighter hue. The flowers can even end up with a light pastel pink colour. This peony is only available in late season, but definitely worth the wait. Although Dinner Plate was bred in 1968 by American peony breeder Klehm, this variety is still relatively new and exclusive on the Dutch market. It is gaining in popularity though, because of the size of its flowers and its well liked colour. We’re going to see a lot more of these beauties in the coming years. The flowers of this peonies are huge when they’ve opened up. Give them enough space to fully unfold. Because of the uniqueness of its flowers, we advise you to display her on its own so it has a chance to shine! J.N.M. Knol, Rolin Flowers, Kwekerij de Kokmeeuw, Stavenuiter Snijheesters, Paeon B.V.